Serena Williams and Naomi Osaka go face each oda for US Open Women final on Saturday for New York. 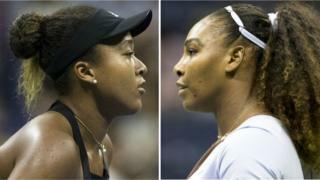 Dis final go be di most expensive Tennis match for US Open history. Di winner of di match go pocket $3.8 million wey be di prize money for di champion, $100,000 more dan wetin dey pay last year. Prize money for US Open don increase by 57 percent since 2013. Di US Open na di first tournament to give equal prize money to both men and women for 1973. Di total purse for di 2018 tournament na $53million more dan 5 percent increase ontop di $50.4 million for 2017. Serena dey look to equal Australian Margaret Court record of 24 Grand Slam singles title just one year afta she born her pikin. For July, she lose di Wimbledon final to Angelique Kerber and she fit win her first Grand Slam title since she born her daughter Olympia. Osaka, na di first Japanese woman to reach Grand Slam final. Twenty seed Osaka, wey dey call Williams her role model bin win her for dia previous match.But dat na for Miami Open dis year, di 36 year old second tournament since she return.